Here is a fun treat for breakfast or anytime snack. You can make them ahead of time then serve them warm or cold for the kids after school. Dip them in a caramel rum sauce for the adults (see recipe below for kids version also) or just with a sprinkle of powdered sugar they even taste great as a dessert! I have also baked them in the oven for less calories! After you try these you decide which way you love them more! Check out the recipe for the Caramel Rum Sauce at the end! 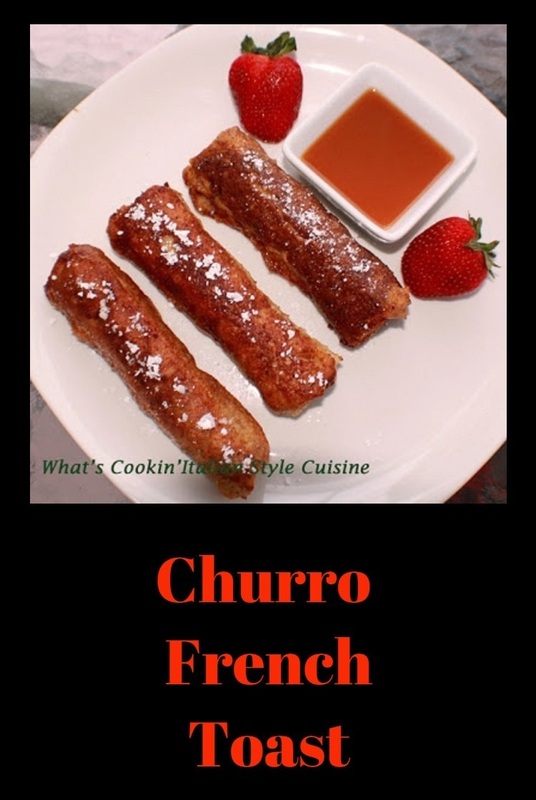 Here is a great little twist on the delicious fried churro for Cinco De Mayo. 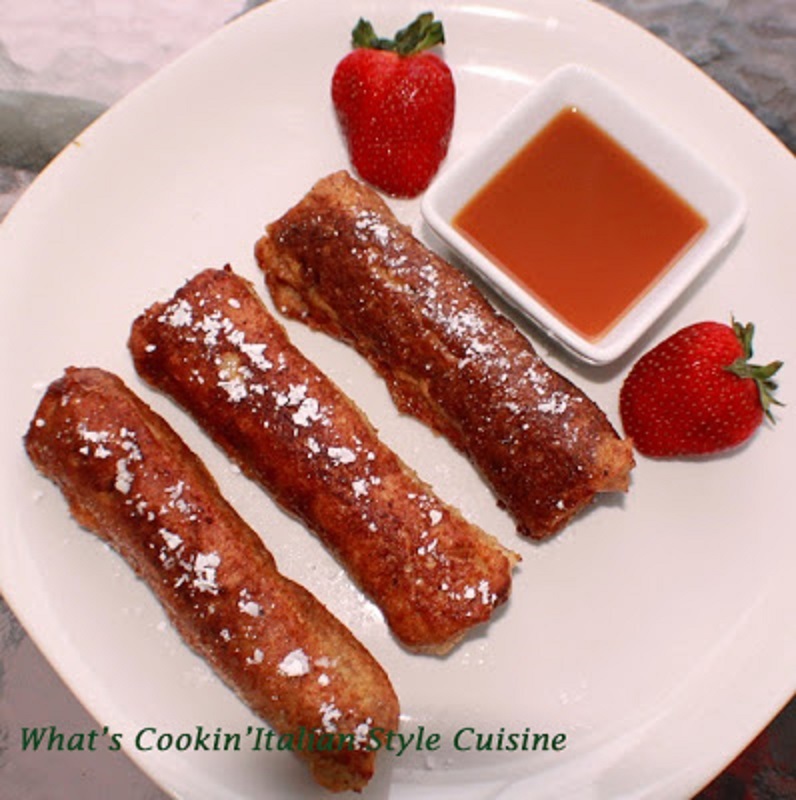 The kids love these little french toast sticks. The really are delicious. You don't have to serve them with the caramel but they turn out to be an Adult dessert with the caramel sauce. The breakfast can consist of any pureed fruit sauce over them and they would be a delightful morning breakfast for the kids. Especially delicious with caramel ice cream topping you can purchase in the store with mashed bananas! That's my kids favorite! Sliced Soft Italian style bread, cinnamon bread or your favorite brand of bread any kind of a soft bread is a great choice! As many slices as it takes to feed your size family. You can dip into caramel melted any favorite breakfast syrups. Flatten bread out on a cutting board with a rolling pin, cutting the crusts off with a sharp knife. Spread the bread with butter, sprinkle cinnamon sugar mixture evenly on the bread and make as many as you need for the family. Roll up like a cigar shape. Place seam down until your done with all your making on wax paper. In a pie plate beat 2 eggs, milk add 1/4 teaspoon cinnamon and 3 tablespoons mix mix until blended. Dip the rolls into the mixture. Heat canola oil in a fry pan on medium heat. Fry each roll seam side down saute until browned on each side. Drain on paper towels. 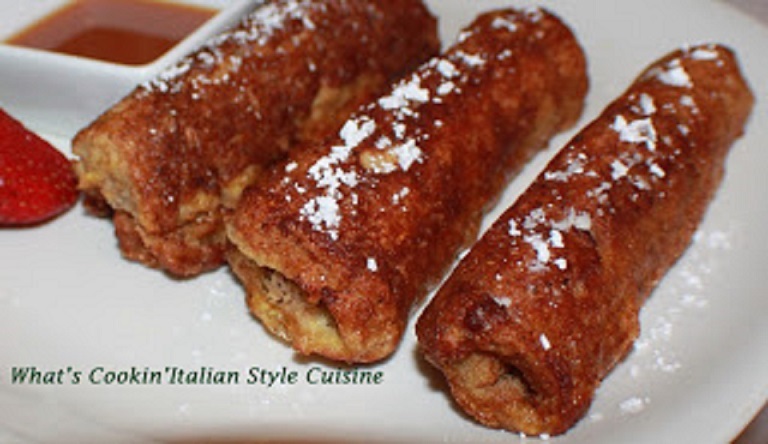 Sprinkle with powdered sugar mixed with cinnamon while still hot and serve. anything like this before. So great to find someone with some original thoughts on this topic.